Many were rightly bummed out when Power Quest called it quits a few years back following a period of lineup turbulence that saw Steve Williams as the lone founding member and continually parched for reliable vocal talent. The brief union between this band and vocal mercenary Chitty Somapala did yield a fantastic album that saw the band exploring some slightly darker territory than usual, but it ended about as soon as it began and fate found the Power Quest name gone from the scene and Steve playing support for a brief stint with Eden’s Curse. But as this band’s own third studio LP put it, magic never dies, and a few months ago the lineup that produced Blood Alliance was back, now with Dendera front man Ashley Edison taking the lead and nowhere to go but up. The darker imagery is not just for show either, as Face The Raven takes an approach that is still recognizably in the Power Quest formula, but lyrically and atmospherically speaking, quite different. Edison’s vocals are a bit cleaner than his often throaty and piercing shrieks with Dendera, but they have a very different attitude than former front man Alessio Garavello’s squeaky clean reminiscence of Michael Kiske, coming just a hair short of sounding like Ralf Scheepers. There isn’t anything on here resembling the sort of lovelorn 80s pop-tinged balladry found on the mid-2000s albums of this outfit, though the melodic contours are still recognizable and the keyboards are a major factor, particularly on rerecording of “Blood Alliance”, which sees a nimbler and slightly less gravely vocal display, but also a heavier production. Perhaps even more impressive than the brilliance of the vocal work on here and the drive towards a darker aesthetic is the continual adherence to past practices in spite of it all. The dueling guitar solo work of the Owen brothers on here is about as flashy and impressive as anything that Bickers and Totman pulled off on Wings Of Forever, and yet that melodic expressiveness that shone through when Andrea Martongelli took over has managed to hold on to an extent in how the solos are shaped. The brilliance on display during the interchange on “Face The Raven” is positively spellbinding, as is the one found on the throwback sequel song “Coming Home (Sacred Land II)”, a song that actually remembers the old days of speedy melodic goodness about as much as it does the more restrained and atmospheric character of latter ones. 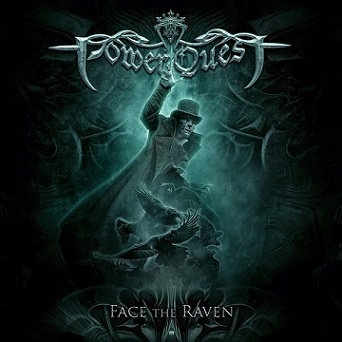 It might be a bit presumptive to state this given that this lineup has only produced two new songs and one rerecorded epic, but this version of Power Quest has the potential to outclass the older one if all the right elements come together on the upcoming full length album as they have mostly done here. The only thing that really works against this is its short duration, which leaves one hungrier for more and frustrated that the next go around will likely have to wait for a good several months. But if nothing else, if this doesn’t satisfy the naysayers, they will have literally zero credibility if attempting to call this a Dragonforce clone. This entry was posted in Reviews and tagged dragonforce, England, Face The Raven, power metal, Power Quest, UK.